Tajikistan, (Tadjikistan Тоҷикистон), officially the Republic of Tajikistan, is a mountainous landlocked country in Central Asia. Afghanistan borders to the south, Uzbekistan to the west, Kyrgyzstan to the north, and China to the east. Tajikistan also sits next to Pakistan but is separated by the narrow Wakhan Corridor. The country is geographically, politically and culturally divided in the center: the sparsely populated Gorno-Badakhshan Autonomous Region (GBAO) occupies the mountainous eastern half; while the agrarian and urban centers of Tajikistan make up the western and far northern parts. Most of Tajikistan's population belongs to the Tajik ethnic group, who share culture and history with the Iranian peoples and speak a dialect of the Persian language (officially named Tajiki). However, the country is also home to many other ethnic groups, primarily Uzbeks, Kyrgyz, and a small minority of Russians, and most Tajiks speak Russian and understand Uzbek. The capital and largest city is Dushanbe, located among lowlands in the west of the country. In modern times, the country was part of the Russian Empire and Soviet Union, achieving independence in 1991. From 1992-1997, it experienced a devastating civil war, from which it has mostly recovered. Although tensions remain between various groups and the country faces economic challenges, Tajikistan today is a very peaceful and rapidly developing nation. Tajikistan is a landlocked country, and is almost completely covered by mountains, except for areas of hilly lowlands in the southwest and in the north in the Fergana Valley; 50% of the country is over 3,000 meters (10,000ft) above sea level. The country is essentially divided into several parts by enormous mountain ranges, making transportation and communications difficult. Major mountain ranges include the Pamir in the east, which cover nearly all of Gorno-Badakhshan Province; the Fann Mountains in the northwest, which separate Dushanbe and the southwest territories from the northern part of the country; and branches of the Tien Shan in the northeast, which sweep down from Kyrgyzstan and adjoin the Pamir. Many peaks in Tajikistan are among the highest in the world, rising to a maximum of 7,495m (24,590ft) at Ismoil Somoni Peak (formerly Peak Communism). Tajikistan is a major water source for Central Asia, and many wild and beautiful rivers flow across Tajikistan and along its borders, including the unruly Pyanj (which eventually becomes the Amu Darya) along the entire southern border with Afghanistan; the Syr Darya in the north, one of Central Asia's most important waterways; and the Vaksh, which flows from north to south from Kyrgyzstan to the Pyanj, and features the enormous scenic reservoir at Nurek, held back by the world's highest dam. Lakes include Lake Kara-Kol in Gorno-Badakhshan, a huge salty runoff lake in the middle of a vast breathtaking wilderness. Tajikistan is a Presidential Republic, in which the President is both head of State and the Government. Since 1994, Emomali Rakhmon has held this office. It is also a multi-party democracy, with parties sending candidates to a bi-cameral parliament. The Supreme Assembly (Majlisi Oli) includes the 63-seat Assembly of Representatives (Majlisi Namoyandagon), which meets year-round, and the 33-seat National Assembly (Majlisi Milli), which meets at least twice per year. The pro-government People's Democratic Party continued to control both houses of the parliament after the elections of 2005; having gained 52 of the 63 seats in the Assembly of Representatives. As of 2008, population is estimated at 7,200,000; 80% are Tajik, 15% Uzbek, 1% Russian, 1% Kyrgyz, and 2.6% other. Ethnic minorities are concentrated in specific areas: Uzbeks in the Fergana Valley area in the north; Kyrgyz in the extreme north and west in alpine regions; virtually all Russians and others live in Dushanbe. In addition, many people in Gorno-Badakhshan consider themselves to be a separate ethnic group (Pamiri), though they share a common language and history with all Tajik people. The population growth rate and life expectancy are relatively high for an ex-Soviet republic, at 1.85% and 65 years, respectively. The Tajik language, or Tajiki, (тоҷикӣ) is a modern variety of Persian language spoken in Central Asia. An Indo-European language of the Iranian language group, most speakers of Tajik live in Tajikistan and Uzbekistan, and Tajik is the official language of Tajikistan. In addition Uzbek is spoken in Uzbek communities, and many ethnic Tajiks speak Uzbek, these groups having a long shared history. Kyrgyz is spoken in high mountainous areas in the north and west. Russian is still spoken by most of the population as a common business and administrative language, an important link to the rest of the post-soviet nations. In the cities Russian is predominant. Most Tajiks belong to the Islamic faith. One important aspect of religion in the country is that most people in Gorno-Badakhshan are Shi'a, comprising 15% of all Muslims; the other 85% are Sunni. There are also small communities of Orthodox Christian and Jewish believers as well. Tajiks are known for being devoutly religious, with most holding to traditional Islamic norms of prayer and fasting, etc. This creates in the country a different social atmosphere than that of its neighbors. Tajikistan is an extremely rural country, containing vast areas of alpine and desert wilderness, along with intensely farmed regions in the southwest. 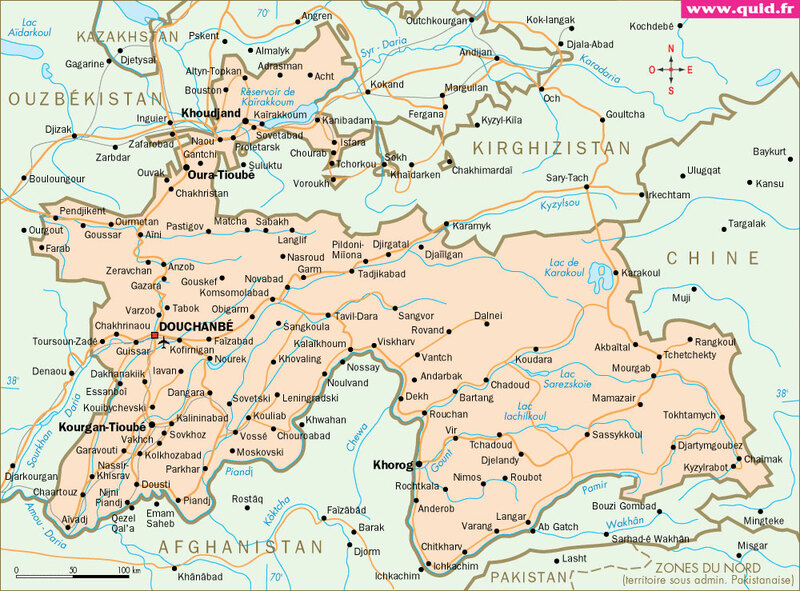 There are only a few urban centers: Dushanbe, Khujand (formerly Leninabad), Kulob, Khorog (Capital of Gorno-Badakhshan), Kurgan Teppe, and Penjikent. Characteristic of Tajikistan are the many small towns and regional centers which serve as transport and economic hubs for the under-developed countryside and nomadic herders. Capital Dushanbe, in the west of the country, is the economic, legal and transportation center of the country, in addition to being by far the largest city. Nearly the entire population of ethnic Russians and a surprisingly large number international workers live here. Most of Tajikistan's industrial base is also concentrated around Dushanbe. These days, it is a pleasant, slow-paced "garden" city, its streets lined with towering leafy plantain trees and large parks. Many upscale hotels and shops have appeared, and internet cafes are everywhere. The Culture of Tajikistan has developed over several thousand years. Historically, Tajiks and Persians come from very similar stock with a mutual language and are related as part of the larger group of Iranian peoples, though ancient towns such as Bukhara, Samarkand, Herat, Balkh and Khiva which are inhabited by a majority of Tajiks are not currently part of the country. The Tajiks' ancestors were from Scythian proto-Indo-European tribes who were nomads of the Eurasian steppes and were among the first to settle in Central Asia about 4000 years ago. The territory of Tajikistan has seen many conquests and cultural influences, including campaigns by the Persians and Alexander of Macedonia. Zoroaster, the founder of Zoroastrianism, was from the area, and the Arabs later introduced Islam beginning in the tenth century. The Soviet period dramatically changed the culture of the country, introducing western culture and art and attempting to suppress the Islamic faith. Traditional Tajik cuisine has much in common with Persian cuisine, and features such dishes as kabuli plov, qabili plov, shashlik and sumanak. Traditional Tajik meals start with sweet dishes such as halva and tea, and then progress to soups and meat, before finishing with plov. Plov is also locally called "Osh". All meals are accompanied by non, a type of flatbread common to Central Asia, also called lepyoshka. Other meals include Shorpa (meat and potato soup), Samsa (samosa), and laghmon (a Chinese-style noodle and meat dish). The most common beverage is green tea (choi) and sometimes kefir (drinking yoghurt) is offered. Tajikistan is currently one of the poorest countries in Central Asia, though the economic well being of Tajiks has improved markedly in the last decade, following the end of the civil war in 1997. New roads, buildings and industries are being constructed. The main sources of income are cotton and wheat crops, aluminum processing, mining of precious metals, hydroelectric power exports, and remittances by emigrant workers. The country has a massive potential for hydro-power generation; it already boasts the world's highest dam, which supplies 98% of the country's needs, and is building an even higher dam on the same river, in addition to several smaller ones. The country's road network is undergoing major repairs as well. Economic growth has averaged 7-10% over the past few years, and GDP per capita was $1,800 in 2007. Official currency is the Somoni, which is divided into 100 Diram. 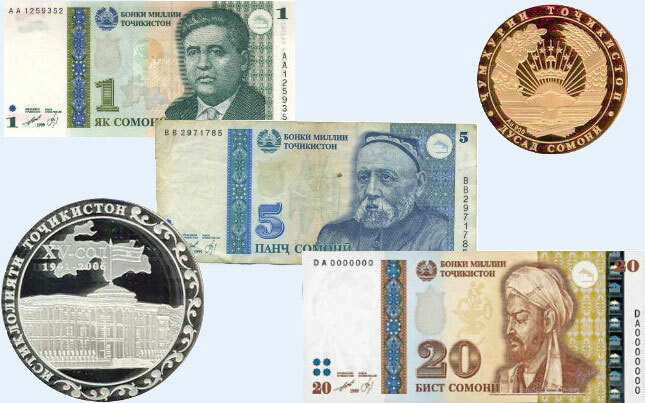 Notes are issued in denominations of 1, 5, 10, 20, 50, and 100 Somoni. Coins (in Diram) of various denominations are also used.